The Shri Mahalakshmi Jain (Ambabai) Temple of Kolhapur in Maharashtra, India, is one of the most famous temples of Jainism and Hinduism of the state. 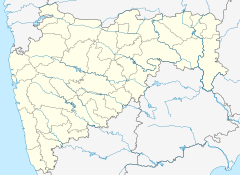 Located on the banks of the Panchganga River,it is about 156 miles (252km) south of Pune. Jain statues inscribed on the walls of the temple. Mounted on a stone platform, the murti of the crowned goddess is made of gemstone and weighs about 40 kilograms. The image of Mahalakshmi carved in black stone is 3 feet in height. The Shri Yantra is carved on one of the walls in the temple. A stone lion (the vahana of the goddess), stands behind the statue. The crown contains an image of the Sheshnag, the serpent of Vishnu. In her four hands, the deity of Mahalakshmi holds objects of symbolic value. The lower right hand holds a mhalunga (a citrus fruit), in the upper right, a large mace (kaumodaki) the mace of Vishnu with its head touching the ground, in the upper left a shield and in the lower left, a bowl (panpatra). Unlike most Hindu sacred images, which face north or east, the deity faces West (Pashchim). There is a small open window on the western wall, through which the light of the setting sun falls on the face of the image for three days around the 21st of each March and September. There are a number of other shrines in the courtyard to the Navagrahas, Surya, Mahishasuramardini, Vitthal-Rakhmai, Shiva, Vishnu, Tulja Bhavani and others. Some of these images date back to the 11th century, while some are of recent origin. Also located in the courtyard is the temple tank “Manikarnika Kund”, on whose bank is a shrine to Visweshwar Mahadev. The temple belongs architecturally to the Chalukya empire and was first built in the 7th century. The temple is referred to in multiple Puranas. There is evidence to show that the Konkan king Kamadeo, Chalukyas, Shilahara, Yadavas of devagiri dynasties visited this city. Adi Shankaracharya also visited. Chhatrapati Shivaji Maharaj & Sambhaji reigned. In 109 A.D, Karnadeo cut off the jungle and brought the temple to light. The existence goes back to the 8th century, according to Dr. Bhandarkar & Mr. Khare.[who?] In the 8th century, the temple sank down due to earthquake. In the 9th century, Gandavadix (King) extended the temple by building Mahakali Mandir. During 1178–1209, in the reign of Raja Jaysing & Sindhava, South gate & Atibaleshwar Temple were built. In 1218, Yadav king Tolum built Mahadwar, and offered jewels to Devi. Further, Shilaharas built Maha Sarasvati Mandir. He being a Jain, got 64 idols carved. It is possible that new idol called Padmavati was installed at that time. [according to whom?] Further, in Chalukya times, Ganapati before the temple was installed. In the 13th century, Shankaracharya built Nagar Khana & Office, Deepmalas. Later during the time of maratha empire, the temple was repaired. Though many invasions over this part of India have caused some damages of the beautiful idols which are all around the temple. During 1712–1792 (Sambhaje Reign) Narhar Bhat Shastree had a dream which he told to Sambhajee. In the Mughal reign, the worshippers had hidden the idol for protection. Believing Sangavakar's dream, Sambhajee started a search. This idol was found in a house in Kapila Teertha Market in the city. According to Sambhaji's letter dated 8 November 1723, Sindhoji Hindurao Ghorpade of Panhala installed the idol again on 26 September 1712 (Monday, Ashwin Vijiya Dashami). The number of devotees grew, and in due course of time, the Devi became the Deity of Maharashtra. The deity began to denude due to Abhishekas. So Sankeshwar Shankaracharya got it repaired. After Vajralep & sacrifices, it was again installed at the hands of Kolhapur Shahajee Raje in 1954. There are 5 main temples and 7 Deepamalas now. Around are 35 temples of various sizes and 20 shops. There are 5 Hemad-style tops and a Garud Mandap. Special Events: A festival image of the deity is taken out in procession around the temple courtyard each Friday, and on full moon days. Kirnotsav (lit. festival of Sun Rays) is celebrated in the Mahalakshmi Temple at Kolhapur, when the rays of the sun fall directly on the deity at the time of sunset. It is said that the Sun god pays his homage to Mahalakshmi Ambabai for three days in a year. This will be on the occasion of “RathaSaptami”. 31 January & 9 November: Sun rays fall directly on the feet of the deity. 1 February & 10 November: Sun rays fall directly on the chest of the deity. 2 February & 11 November: Sun rays fall directly on the entire body of the deity. It is not surprising that even the rays of a setting sun pay homage to Goddess Mahalakshmi Ambabai as the life of human being revolves around illumination and prosperity. But it is the wonder of wise architects who built the temple of Mahalakshmi at Kolhapur that the rays of the setting Sun, bow at the feet of the Goddess through a window, for a while before vanishing. It is the architect's excellence, which was done more than 1000 years ago, and can still be observed. This special event is celebrated by thousands of people as Kiranotsav. ^ a b c Tate, Karen (2005). Sacred Places of Goddess: 108 Destinations. CCC Publishing. p. 197. ^ "Mahalakshmi Kolhapur Daily Schedule".